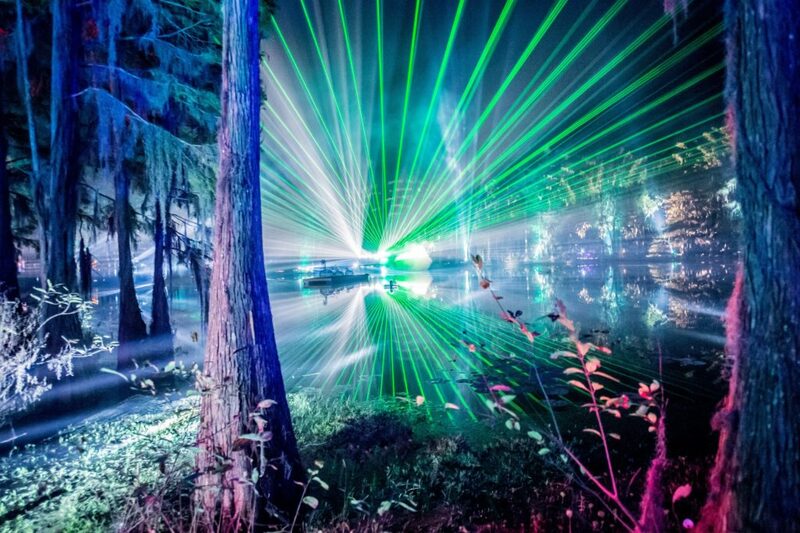 Hulaween has one of the best lineups of the summer featuring an array of talent. 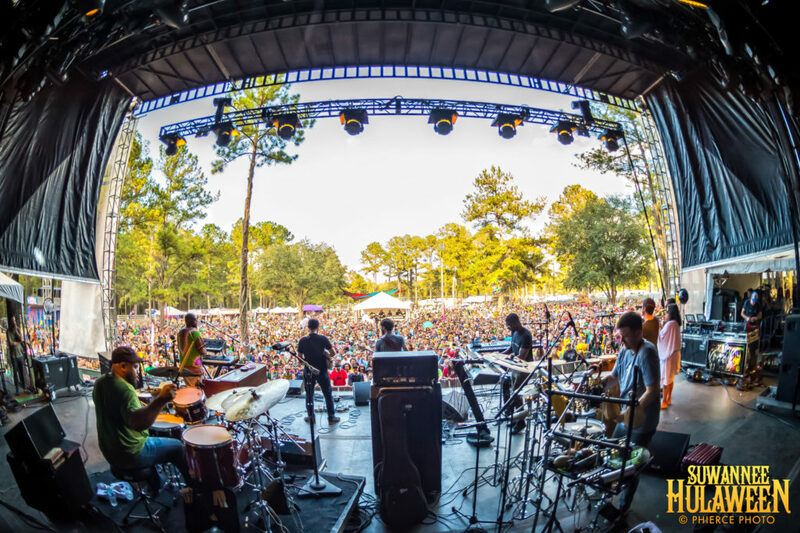 The festival in Live Oak, Florida will be featuring a ridiculous lineup featuring 3 nights of The String Cheese Incident, Odesza, Jamiroquai, Janelle Monae, Tipper, STS9, Stephen Marley, Vulfpeck, and Gramatik just to name a few. 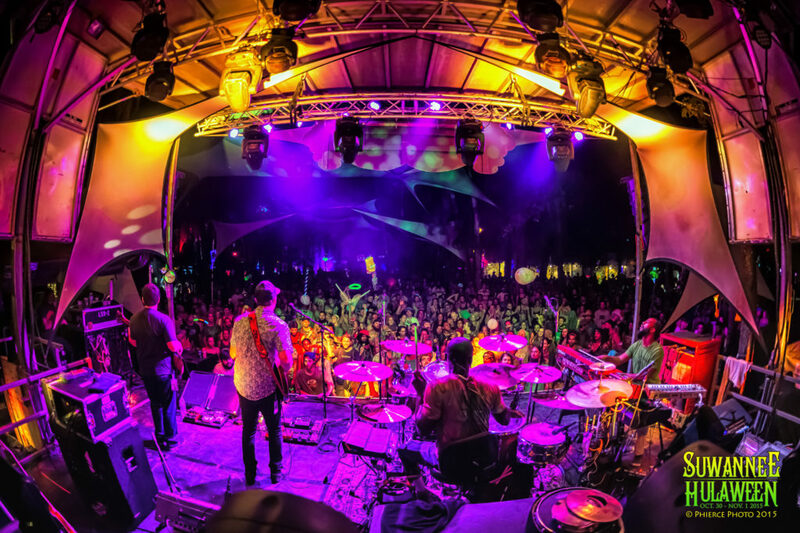 The festival has such depth of talent that you will almost certainly discover a new act that blows you away. Jamiroquai, a 90's jazz-funk band returns to the US this year for the first time in 13 years. Enjoy the music video below of "Virtual Insanity". 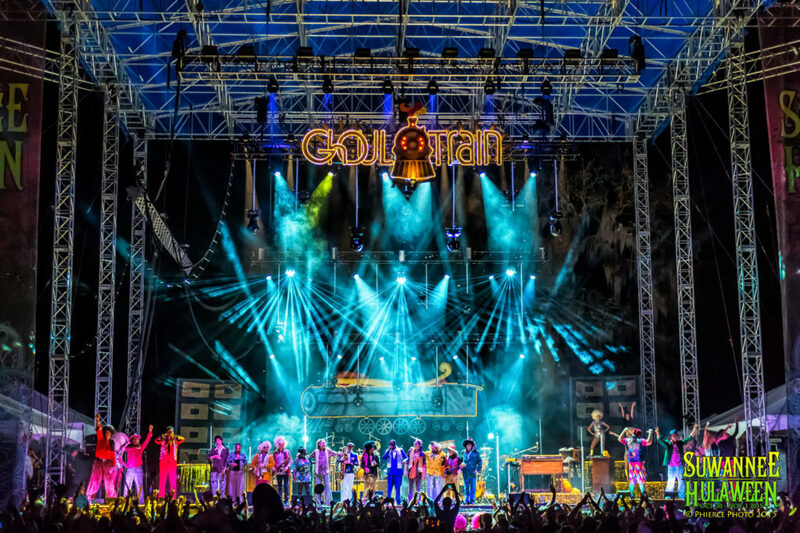 Hulaween will surely bring out the finest costumes and characters over the Halloween weekend. Slightly smaller acts that you may not have heard of and should absolutely not miss include: Turkuaz, a eccentrically colorful, funk powerhouse band full of horns and singers; Jade Cicada, an infectious, bass heavy-hitter that always leaves you wanting more; Sunsquabi a Boulder-local funky jamtronica band who is growing exponentially in front of our eyes; and Fisher from Claude VonStroke's Dirtybird label who will be bringing the dance party with the house vibes! 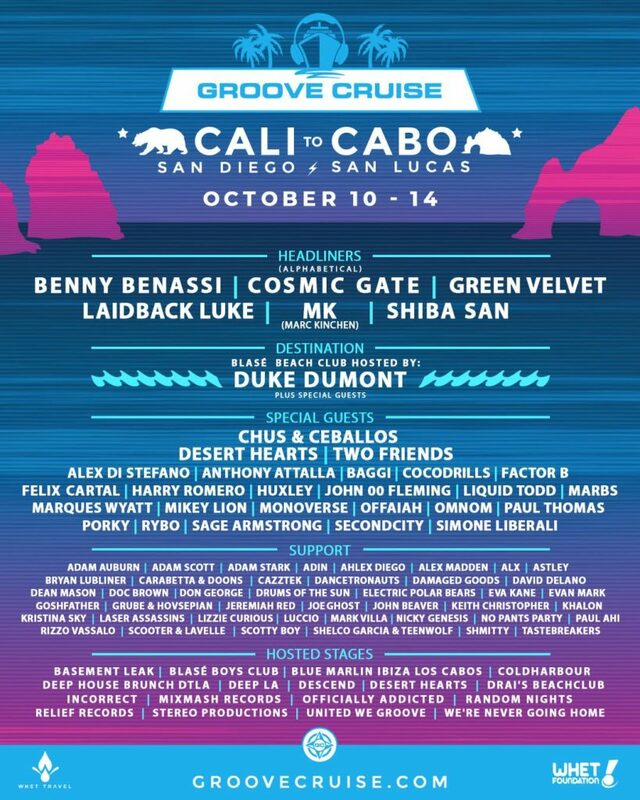 GROOVE CRUISE CABO ANNOUNCES PHASE II LINEUP FOR 30TH SAIL FEAT. DUKE DUMONT, MK, GREEN VELVET, THE DESERT HEARTS CREW, TWO FRIENDS + MORE! July 10, 2018 — Hop aboard the original floating dance music festival as Groove Cruise Cabo announces Phase II of their 2018 lineup today. Boarding Norwegian Pearl this October 10-14, 2018 is an array of electronic music legends and up-and-coming acts, primed to deliver the best in house, trance and techno for four incredible days on the high seas. Don’t miss this opportunity to dance, discover, and follow your inner compass to the experience of a lifetime — cruise packages available here. As Groove Cruise prepares to take its monumental 30th sail, the soundtrack for this year’s cruise will be provided by an amazing roster of 2018 headliners that now include Detroit house music phenom Marc Kinchen (MK), UK house producer and Blasé Boys Club owner Duke Dumont, Chicago house and techno legend Green Velvet, Mikey Lion, Marbs, Porky, and Rybo of the beloved Desert Hearts, Chus & Ceballos plus L.A.-based progressive house duo Two Friends. These newly added artists will be performing along with previously announced Phase I headliners legendary Italian DJ/producer Benny Benassi, famed Dutch-Filipino DJ and martial artist Laidback Luke, German trance duo Cosmic Gate, Dirtybird Records signee Shiba San and Marques Wyatt, the Los Angeles-based house DJ named “Best DJ” by LA Weekly. Supporting artists on the lineup include Adam Scott, Anthony Attalla, Baggi, Cocodrills, Felix Cartal, Huxley, Liquid Todd, Omnom, Sage Armstrong, Secondcity, Tim Baresko, Adam Auburn, Adin, Ahlex Diego, Alex Madden, Astley, Bryan Lubliner, Damaged Goods, Dancetronauts, David Delano, Dean Mason, Drums of the Sun, Dsk Chk, Electric Polar Bears, Eva Kane, Goshfather, Grube & Hovsepian, Jeremiah Red, Joe Ghost, John Beaver, Keith Christopher, Kristina Sky, Luccio, Mark Villa, Paul Ahi, Pyrodox, Rizzo Vassalo, Scooter & Lavelle, Scotty Boy, Shmitty, and Tastebreakers. Departing from San Diego with a final destination of Mexico’s famous port of Cabo San Lucas serves as the premier stop for GCFAM, with a private party at Blue Marlin Ibiza Los Cabos at ME Cabo, one of Mexico’s leading resorts, as a marquee event during the voyage. This beautiful venue offers dramatic views just steps away from the pristine sands of Playa El Médano. Stay for the party or walk to the marina, shops, bars, and restaurants nearby. Transportation and entry to the ME resort is included in the cruise fare but food, beverage and cabanas will be available for purchase. 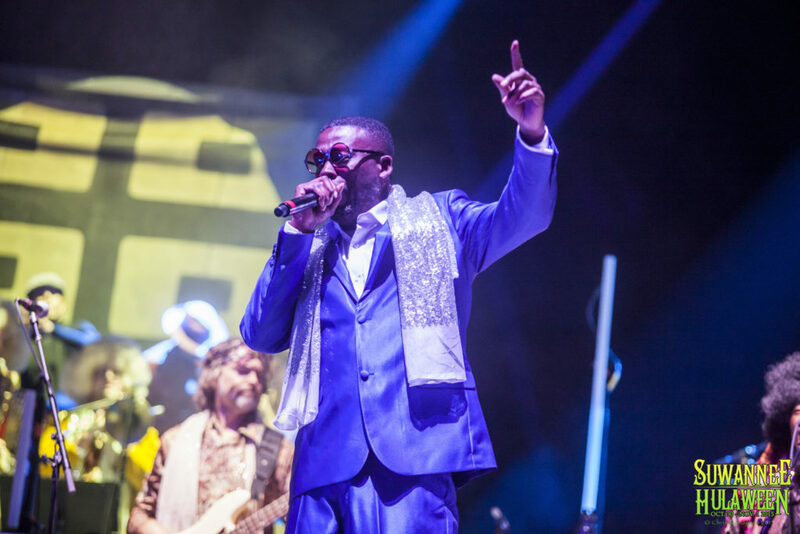 As on past Groove Cruises, the festival will also feature a stellar series of hosted stages, ensuring that there is more than enough music to keep cruisers dancing ‘til sunrise. On-board, Green Velvet will be hosting a Relief Records stage alongside Chus & Ceballos who will host a Stereo Productions stage, while in Cabo, Duke Dumontalong with some special guests will be hosting one of his beloved Blasé Beach Club events. In addition, captains can look forward to stage takeovers by Basement Leak, Blue Marlin Ibiza Los Cabos, Coldharbour, Deep House Brunch DTLA, Deep LA, Descend, Drai’s Beachclub, Incorrect, Mixmash Records, Officially Addicted, Random Nights, Stereo Productions and We’re Never Going Home. Last but not least, Groove Cruise Trance Fam will be the first to experience EMBARK: Trance, an oceanic voyage into the heart of Groove Cruise. Featuring John 00 Fleming, Alex Di Stefano, Paul Thomas, Factor B and Monoverse, EMBARK will take captains on an emotive, beautiful journey through sound. More info TBA soon! 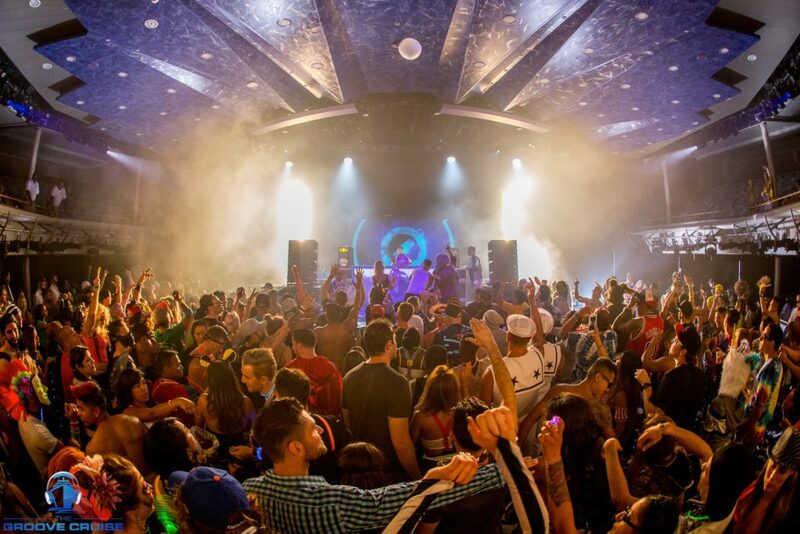 Groove Cruise is a logistical marvel, combining the non-stop music and loving community of an electronic music festival with the convenience and amenities of a cruise ship. Taking place on the 2,700-passenger Norwegian Pearl, captains can indulge in its imaginative decor and steampunk-themed nightclub. 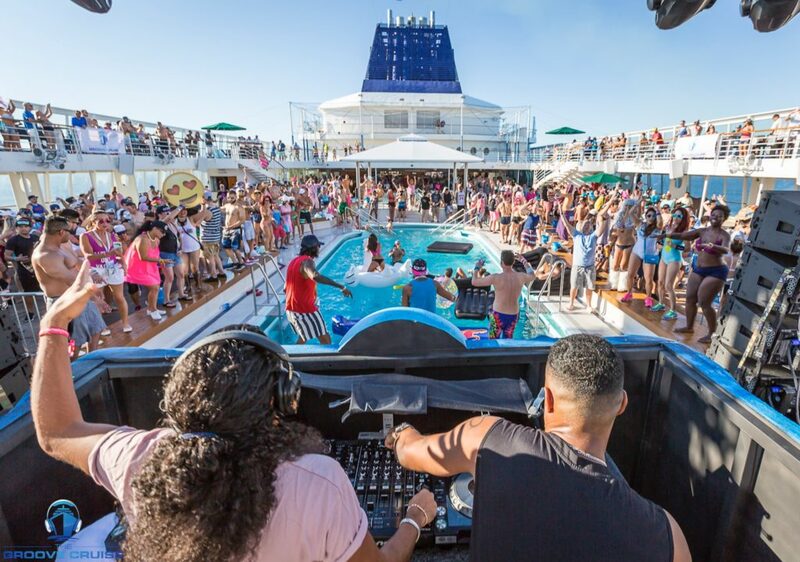 As if the 96 hours of non-stop music across 9 stages wasn’t enough to entertain attendees, the 12 bars and lounges, 13 restaurants, picturesque pool deck, bowling alley and arcade also provide an endless array of activities to keep cruisers occupied all hours of the day and night. More info surrounding on-board activities and artists activations - Coming soon! Over 12,000 people each year choose Whet Travel for their music cruise adventure. Whet Travel has executed 24 full ship charters including Groove Cruise Miami January 10-14, 2019 (15 year anniversary), Cabo and LA as well as Salsa Cruise (20 year anniversary Oct 29-Nov 2 overnight in Havana Cuba). Whet Travel received the prestigious Charter Partner of the year award from Carnival and Norwegian Cruise Lines and Inc Magazine ranked Whet Travel as the #4 fastest growing travel company in the USA.. In this blog post you will learn some of the best proven strategies used by some of the most successful musicians around today. If you have been a professional musician for decades or are just starting out today this article is for you. These seven clever ways to profit from your music have been tested and proven by some of the best musicians out there. This article will help you monetize and maximize the impact of your new musical release. An other strategy that caters to musicians is to enable people to buy the ‘stems’ (individual tracks or instruments) that comprise a song. This strategy will likely only make you money from other fellow musicians. For instance a rudimentary version of this strategy is to sell an instrumental version of your track and remove the vocal stem from the final product. You could also sell just the vocal stems. Perhaps if you are Carlos Santana you could sell the guitar parts only. It is up to you how you slice up your songs and sell the parts. Some musicians refuse to show the listener ‘under the hood’ of the artwork. It is revealing when you tear apart a song into its components. The purpose (from the consumer’s end) is to isolate individual sounds to create a better remix or sample of the song. If you want to encourage others to remix or sample your song, you should consider releasing the stems to one or all of your songs. One clever strategy is to enable the purchase of your music in multiple file types. MP3s, the most common musical file type, is compressed. Compressed files are great to conserve space and to pack as many songs as possible on an iPod or your phone. Compressed files are not high quality. Some careful listeners (a.k.a. Audiophiles) will be able to notice the difference between a compressed file and an uncompressed file if the song is played on high quality speakers or headphones. If you want to make more money from your music, sell different file types at different price points. One great platform that enables you to sell different audio files is Bandcamp. Give your customers incentive to buy all of your albums or an album rather than a song. Some clever musicians prevent the purchase of particular single songs on iTunes and encourage people to buy the album to gain access to that particular song. You can also sell a package that includes your music as well as apparel or memorabilia. You can give a relative discount, compared to buying each item separately, to your fans for buying the package. As you tour, you can and should maximize your reach by selling products at the show. You can sell apparel such as hats or shirts. You can sell memorabilia such as posters or stickers. You can sell your music by offering physical sales of your album. The key to this strategy is hiring someone to manage and run your merchandise table while you are focused on preforming. You need to make sure that your sales will continue while you are on and off stage. Collect emails and make sure to reach out to your fans! If you have an established fanbase, one of the more lucrative strategies is to presell your upcoming album. Pre-sales create excitement, anticipation, and money for you, the artist. When the album is finally released you can be sure that all of your pre-order customers will be thrilled to finally get their ears on your music. Your pre-order customers will help generate a boost to the awareness of your music. Your music depends on word of mouth and people becoming aware of your music. By pre-selling your album, your album will launch from a solid base of passionate fans who will help you every step of the way. Imagine launching your album knowing that you already have 1,000 people who have already bought your album at $10. That is right, you just earned $10,000 prior to the first day, and you now have 1,000 excited fans sharing your album all over social media! Compare that to launching with no guarantee that your album will sell to anyone. Of course if you do your homework by creating incredible music, touring to create enthusiastic fans, and promoting your music on all of your platforms you will likely not launch to the sound of crickets. What is there to loose? Nothing. By Pre-selling your album, you will only extend the time you are able to sell your music. You can even use some of that revenue prior to launch to hire the best mixing and mastering engineers to give your album even more value. Thats it! You have now know the 7 Clever Ways to Profit From Your Music. Join the conversation by commenting. What is your favorite strategy?